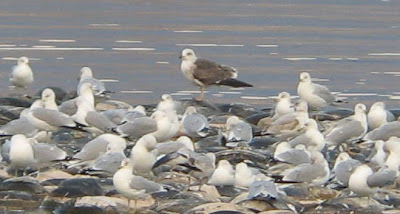 Thayer's Gull - adult with Ring-billed Gulls, Rock Canyon Marina, Elephant Butte Res, January 23rd, 2009. 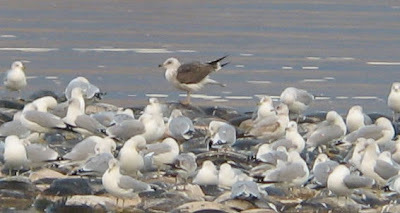 A roost of over 500 gulls at Rock Canyon Marina, Elephant Butte Reservoir produced a great mix of species in an all too brief late afternoon gulling session at this clearly excellent site. 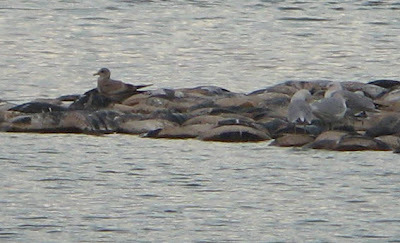 The majority proved to be Ring-billed Gulls but our tally included 15+ American Herring Gulls, 2 California Gulls (adult and 2nd cycle), Thayer's Gull (adult), 2 Mew Gulls (adult and 1st cycle) and a Lesser Black-backed Gull which was clearly immature and probably a 2nd cycle - therefore not the adult reported from the same site on several dates in December and early January. 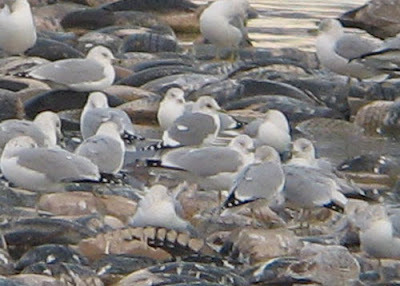 Mew Gull - first-cycle (left) with Ring-billed Gulls, Rock Canyon Marina, Elephant Butte Res, January 23rd, 2009. 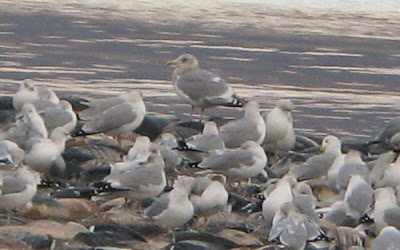 Mew Gull - adult (center) with Ring-billed Gulls, Rock Canyon Marina, Elephant Butte Res, January 23rd, 2009. Lesser Black-backed Gull - second-cycle with Ring-billed Gulls, Rock Canyon Marina, Elephant Butte Res, January 23rd, 2009. 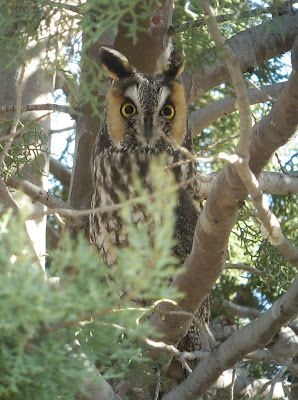 Just back from a recent and rather excellent winter tour of Texas and New Mexico with Birdfinders. 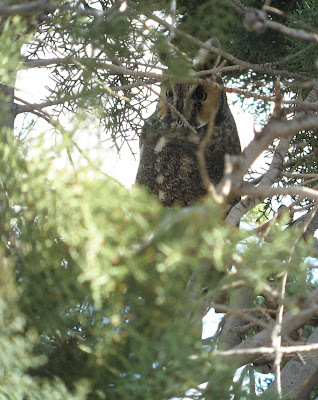 One of the highlights included these Long-eared Owls roosting in evergreens inside a state park very close to the Mexican border, south of Deming in New Mexico. Amherst notes - Jan 5th. Yellow-bellied Sapsucker - first-winter male, Amherst, Hampshire County, January 4th, 2009. 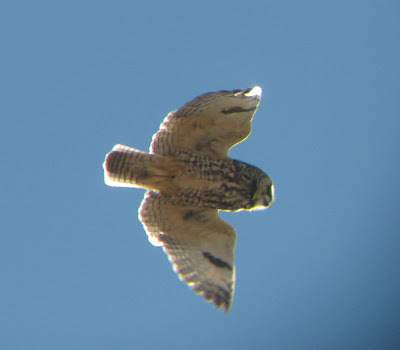 Images taken through glass door using Minox 8 x 32 binoculars and Canon Powershot A540. 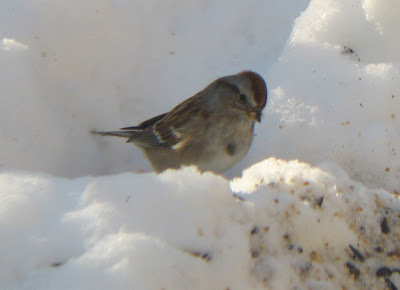 American Tree Sparrow - Amherst, Hampshire County, January 4th, 2009. 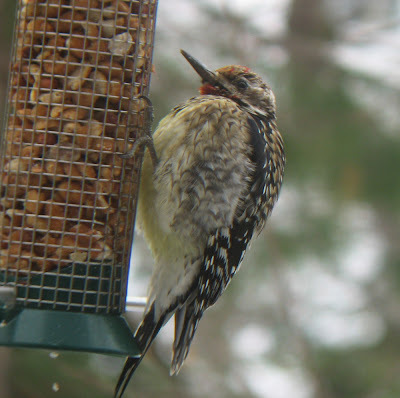 The Yellow-bellied Sapsucker visited our feeders daily from the 2nd - 4th, but didn't show up today, or perhaps we missed him. 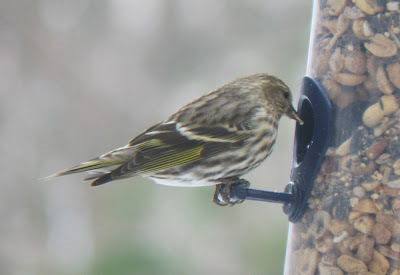 Pine Siskins continue to feature on our feeders and we had a small flock of nine 'ground feeding' on the deck yesterday. Excellent numbers (c.100) continue in the general North Whitney/High Street area of Amherst. 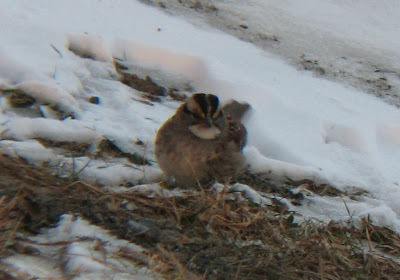 This afternoon, Matan and I surprised a Ruffed Grouse at Orchard Hill on the Umass campus and watched her speed away across the snow. Yellow-bellied Sapsucker - first-winter male, N. Whitney Street, Amherst, Hampshire County, Jan 2nd. 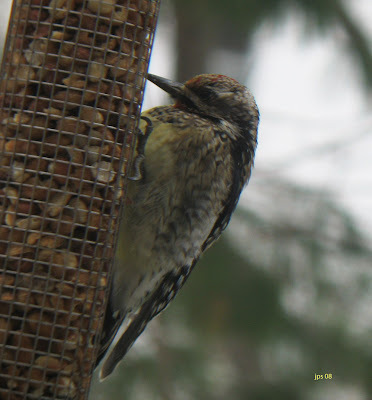 We had a really nice surprise this morning when a young male Yellow-bellied Sapsucker flew into the feeders on our rear deck. 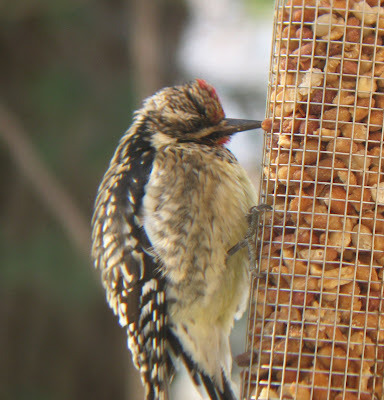 It spent most of its time feeding on peanuts and visited frequently for the remainder of the day. 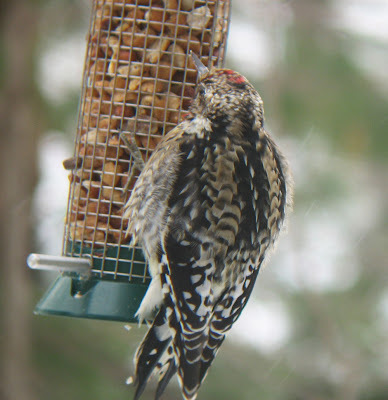 A great bird to have in mid-winter and the first sapsucker that I've since in Amherst since early October. 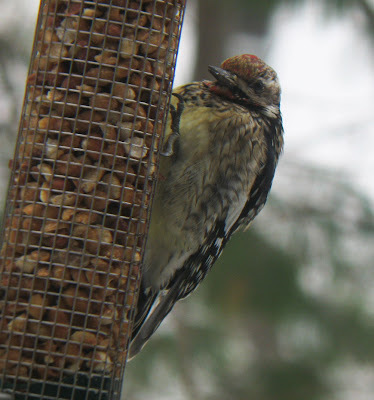 Also today, increasing visits and increasing numbers of Pine Siskins actually working our feeders with up to five present at any one time. Pine Siskins - N. Whitney Street, Amherst, Hampshire County, Jan 2nd. 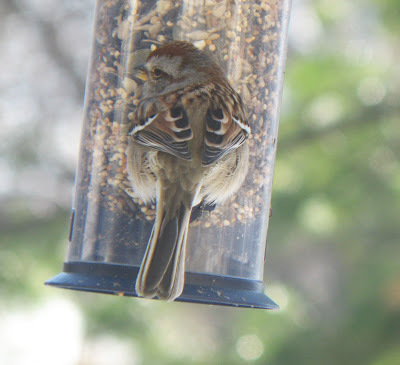 American Tree Sparrow - Image taken through glass window using Canon Powershot A540 and Minox 8 x 32 binocs. 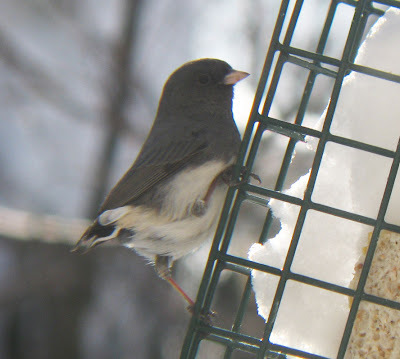 Started the New Year with a relatively low key day just noting birds on foot around Amherst and on the feeders on the back deck at home. 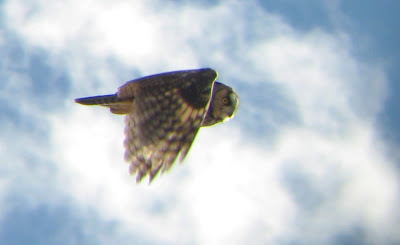 In the afternoon, I spent a bit of time on the Umass campus looking for feeding flocks on the fruit trees and finding some reasonable flocks of American Robins but little else. 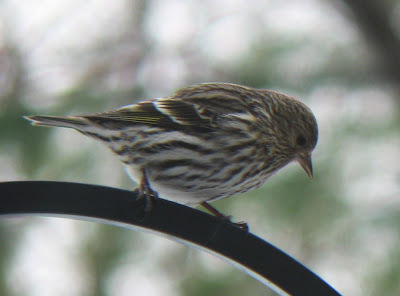 Large numbers (c.100) of Pine Siskins remain in the North Whitney and High Street areas of Amherst and we managed to draw in a couple to our feeders. It wasn't the sort of day for standing around and birding with temperatures topping out at 15 deg F and a bitter Westerly wind making it feel even colder, but bringing its own kind of stark beauty. 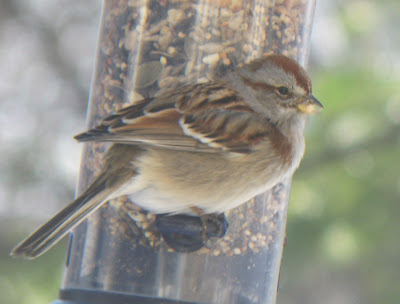 American Tree Sparrow - This bird has been visiting the deck for about a week. 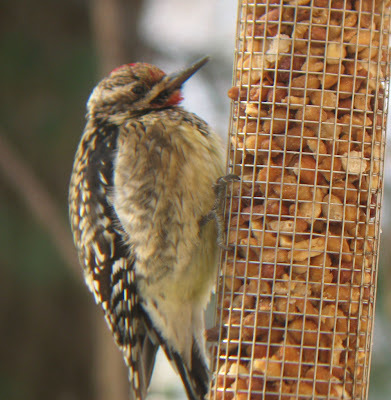 A very nice bird to have on the feeders as I rarely see them around N. Whitney Street. 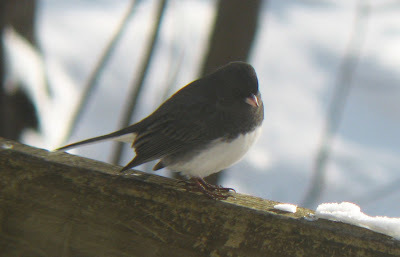 Dark-eyed Juncos - we usually have about 20 of these visiting the deck. 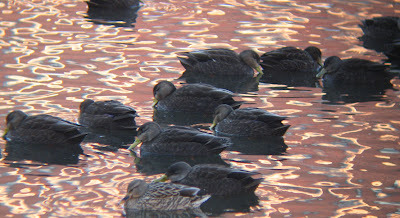 American Black Ducks - part of a tight pack of 15 on the Umass campus pond in the last remaining patch of open water. White-throated Sparrow - Orchard Hill, Umass campus. 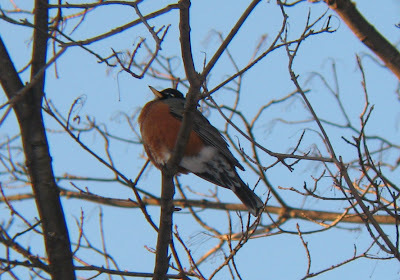 American Robin - c.200 around Orchard Hill, Umass campus, Amherst.